Turmeric is a spice that is most well known for its use in curry that gives foods a kick! However, there are some powerful medicinal properties contained within the root of this common plant, and some of them may surprise you! Foods and powders are the most common uses of turmeric, but tea brewed from its dried root is becoming increasingly popular. This is likely because of all of the purported turmeric health benefits that have been making waves in the alternative health community. So, if you’re considering turmeric tea, check out our list of 7 amazing health benefits that come from this awesome spice! 1. Turmeric Arthritis Remedy: Some studies have shown that there is evidence to support a link between turmeric tea and extracts and arthritis relief. 2. Cancer: There are some interesting theories concerning the turmeric cancer link. Turmeric is certainly not a purported cancer treatment; however it has been used with some success to treat some of the symptoms of skin cancer, such as itching. 3. Tummy Ache: Move over ginger, there is another herb that can help soothe a fussy tummy. 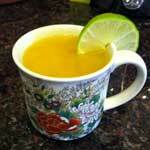 turmeric tea has been shown to be effective in assisting upset stomachs. 4. Respiratory Ails: There is little supporting evidence to research, but users report that turmeric tea can help relief the symptoms of many respiratory issues including bronchitis and the common cold. 5. Turmeric Anti inflammatory remedy: There is research that suggests that turmeric may have anti inflammatory properties that can reduce inflammation that is thought to be correlated with Alzheimer’s disease. 6. Menstrual Issues: Sipping a cup of piping hot tea made from the root of the turmeric plant may help relieve the pain and discomfort associated with menstrual cramping. 7. Headaches: Relaxing with a hot cup of tea may be all you need to quell a headache anyways, particularly if its caused by stress, however there are some users who claim that turmeric tea in particular was helpful in reducing the symptoms of headaches. If nothing else, turmeric can make for a fantastically flavorful cup of tea. However, there are many health conditions that many benefit from or be soothed by enjoying tea brewed from this root.